After the first day of racing in extreme snow and ice conditions, David Higgins and the 2013 WRX STI Rally car and team are off to a fantastic start. A massive winter storm moved into Missouri just ahead of the start of the 2013 100 Acre Wood Rally Race. The storm moved through the American Midwest and covered the event’s roads with several inches of ice and snow. The 2013 Rally America National Championship and is now in its 11th consecutive year set in Missouri’s Ozark foothills, and it’s known for wildly unpredictable weather conditions. But despite snow and icy surfaces, David Higgins and Craig Drew expertly piloted their 2013 Subaru WRX STI to the top position and ended the day with a massive 3 minute 53 second lead. This is the second race in the series, and after leading the race last month, the car crashed and was put back together with duct tape. But despite the odds, the Subaru team took second place in the first Sno*Drift Rally Race in Northern Michigan last month. But Higgins is looking to keep the lead this time and go on to victory today. The Subaru Rally Team USA’s WRX STI with Symmetrical all-wheel-drive handled the below freezing temperatures that produced course surfaces ranging from unplowed snow covered roads to a “tricky mix of grippy wet gravel” and packed snow. The especially challenging road surface effects the cars greatly since the grip can drastically change mid-turn sending cars off their intended line and off the course entirely. This is Higgins third time at the 100 Acre Wood Rally and it’s the only event in the Rally America Championship that he hasn’t won. So Higgins and the Subaru Rally Team has extra incentive to keep the commanding lead that they enjoy after day 1. “I hope this can be our year but at same time championships are won over the whole year, not at a single event,” said Higgins. The 129 miles of competitive stages continues Saturday morning with close to 80 additional stage miles spread over 10 stages. Higgins commented before the start of the event that he had been looking forward to a “proper battle” in the typical high-speed dry conditions for which the 100 Acre Wood Rally is known. 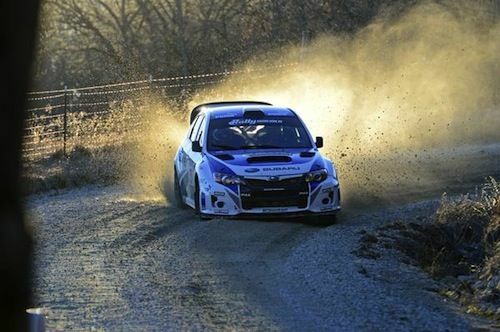 The weather has thrown a curve into the competitive event, and the 2013 Subaru WRX STI and the Subaru Rally Team USA is the perfect vehicle and team to handle the snow and ice.